The reborn Supro continues to push its ambitions beyond mere reissues of heritage amps – will these two all-new models convince us that the past has a future? It’s a serious point, though – you wouldn’t get all that lot on board if your only trick was garage-rock overdrive delivered with a cutesy 60s-style logo and some odd-textured vinyl. So we’re fully expecting these latest non-reissue amps to provide tonal diversity as well as nostalgic charm. They certainly look promising, with a style that’s ‘vintage correct’ but not restrictively old-fashioned. While the words ‘assembled in the USA’ suggest much of the electronic work has been done elsewhere, the standard of finish on both combo and head is exceptional – and even if amp techs might grumble about the PCB-mounted valve bases, the insides are generally pretty tidy as well. 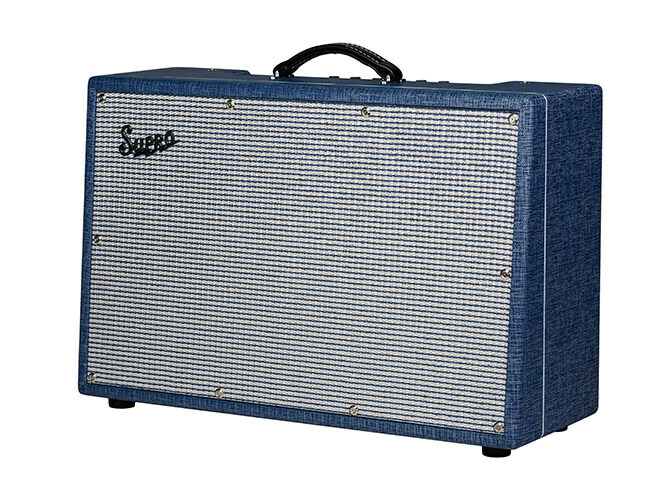 Supro isn’t shy about its intentions with this 2×12 combo: the website describes it as “a clear answer to the Fender Twin and Vox AC30”. At 25 watts it shouldn’t be loud enough to match either of its competitors, but that’s perhaps an advantage in this age of box-room recording and PAs that actually work. It’s billed as Class A and the speakers are Supro’s own ceramic BD12s. 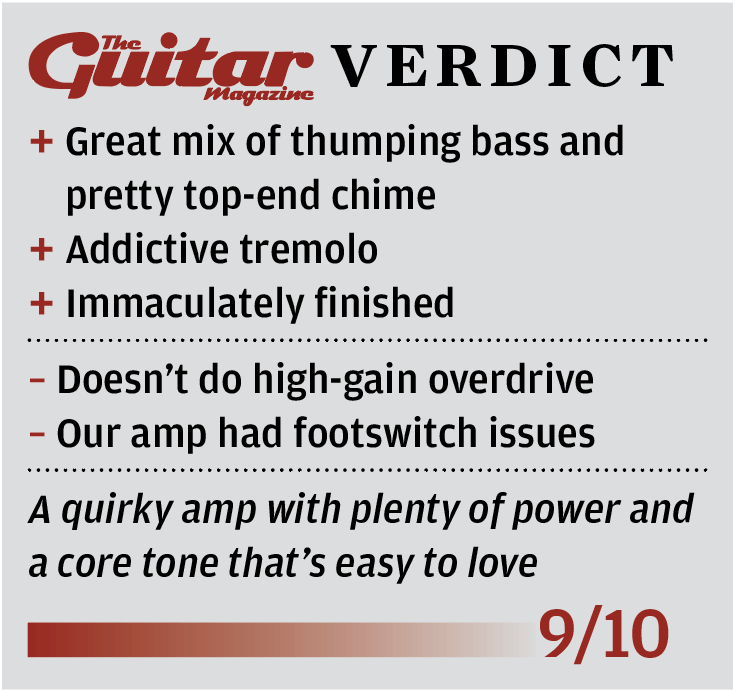 We’ve already reviewed Supros with 6973 output valves, and had few complaints tone-wise. The one issue is that its scarcity could create headaches in the future; but the fact that it’s now used in four different models (and Electro-Harmonix is already selling replacements) offers some reassurance. There’s also a full-width four-spring reverb tank, and a tremolo circuit that uses the same output bias modulation method as the original Supros. 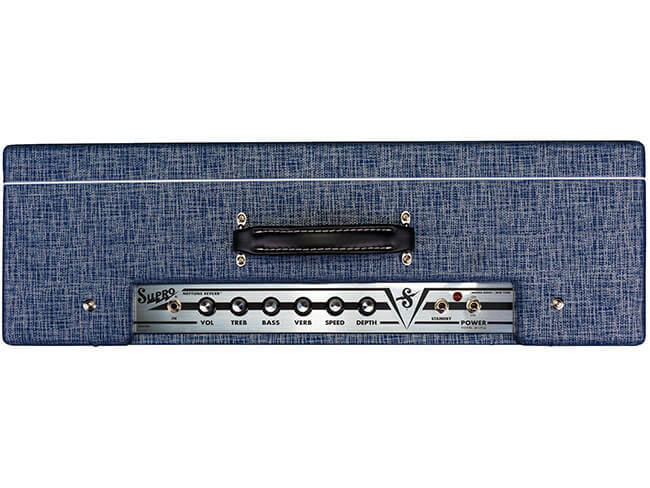 The change from blue to grey vinyl indicates we’re now moving into the 50s-inspired ‘Classic’ series – and we’re on more familiar ground with a pair of 6L6s belting out 50 watts. There’s no tremolo this time, and the reverb tank is only half-size, but you do get two channels and there’s a dual footswitch included for selecting one, two or both in parallel. There’s also a valve-driven effects loop, and this one does a lot more than letting you plug in your delay pedal after the preamp. Using the separate send and return level controls, you can effectively add a master volume or switchable boost to channel two, blend the reverb with the dry-only channel one, or create spooky ‘wet only’ effects. The 1×12 cab supplied for review has the same 12BD speaker found in the Neptune. It’s the same width as the Statesman and, but for the awkwardly mismatched logos, sits quite nicely beneath it. 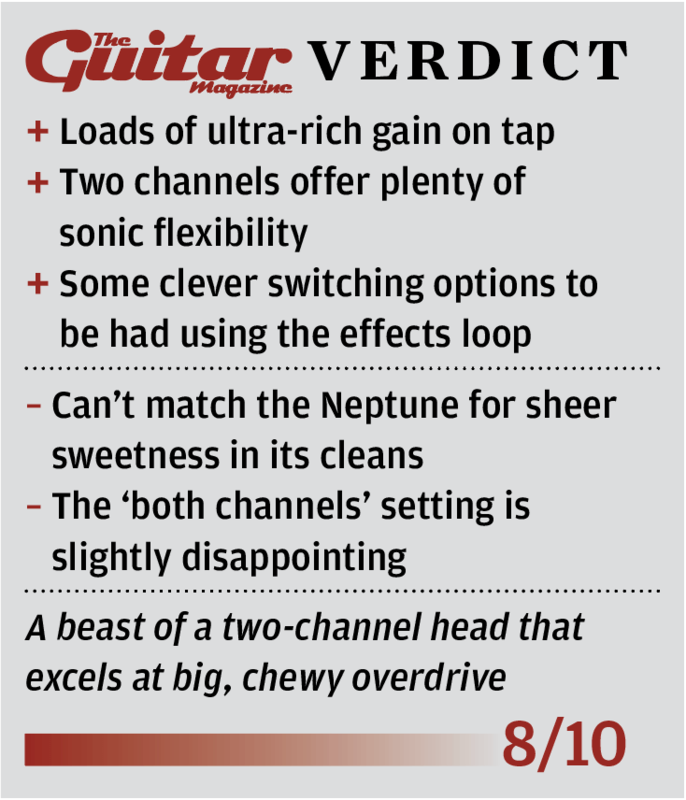 As it’s stated rival, Fender’s classic Twin workhorse isn’t a bad place to start in evaluating the tone of the Neptune. 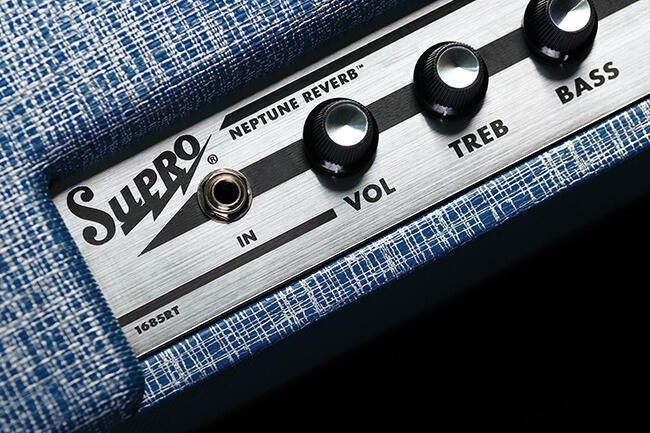 It has the same sparkle in the top end, the same thunderous power in the lows, and – though it clearly can’t compete with an 85-watter for clean headroom – this is one Supro that’s definitely not all about the overdrive. With low-output pickups there’s very little break-up at all until you’re well into the second half of the volume dial – but don’t be in too much of a hurry to go there, because the non-crunching stuff is quite spectacularly nice. You’ll probably need to pull back the bass control to tame the blooming bottom end, but simple chords on a Jazzmaster produce some of the sweetest 6V6-like clean tones ever to tickle our jaded ears. It’s a little thicker than a pure blackface sound, but without the midrange aggression of tweed – a fine halfway house. And while full-blown splattiness is not on the menu, this amp does crunch up very nicely indeed when cranked. The reverb isn’t the most lively but works well enough for general duties, while that throbbing Supro tremolo sounds as cool as ever, even if it doesn’t go as fast or as deep as some. We had issues with switching here, though: a standard TRS footswitch borrowed from another amp wouldn’t work properly, and neither would the other Supro’s channel-switcher. Speaking of the Statesman, let’s say right off that neither of this amp’s two channels can deliver quite the same delicious cleans as the Neptune – but they’re not far off, and as well as the extra wattage there’s a whole load more gain on offer here. Channel one is the straight-ahead rock monster, with just two controls and a preamp circuit lifted from the Thunderbolt model. It sounds hugely rich and meaty, and can dish out the now familiar Supro grind with one hand while combing its quiff with the other. Channel one, based on the Comet combo, is a touch less punchy and offers more of the Neptune’s laid-back freshness. You can easily set up clean/dirty switching in either direction, and the only disappointment is that selecting both channels in parallel is a bit of an anticlimax – you basically get the sound of whichever channel is set loudest with just a hint of added oomph thrown in. Changing from Class A to Class A/B also brings only a subtle shift in perceived power and looseness – it’s not a ‘Vox to Marshall’ transformation. More obviously effective is that ingenious effects loop, which has no trouble in pulling off all the tricks that we mentioned a few paragraphs ago. It all adds up to an impressively versatile two-channel head.